Situated a stone throw away from Chancery Lane tube station on the Central Line, Shimo offers the traditional warmth of Japanese hospitality and authentic dishes at very reasonable prices. 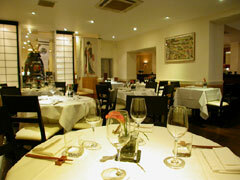 Shimo is the younger sister of Hazuki restaurant in Covent Garden. A full replica armour of the Samurai warrior and founder of the Tokugawa Shogunate is displayed in the restaurant. This is symbolic of Japanese history as November marks the start of the military campaign that succeeded in gaining complete control of the country and in making Edo (Tokyo) the new capital city. Fully equipped with conference and presentation facilities, PA system, AV screen and sound proof technology, the downstairs function room is perfect for special celebrations or business meetings and presentations. You can also bring your own entertainment or ask for the restaurant assistance. Staff here are happy to work with you to ensure your event is a success. The downstairs function room can be hired for the exclusive use and if you�re planning a bigger event exclusive hire of the whole restaurant is available on request. Closed for refurbishment until further notice. Mon-Fri: 12:00pm- 2.30pm & 6.30pm - 9.30pm. The menu combines a variety of all time favourites with some new and innovative recipes. Dishes here are completely authentic, ranging from familiar classics like Maki sushi, Nigiri sushi Temaki and many other combinations that even the most timid can enjoy- smoked salmon, fresh crab, or shrimp. More adventurous delicacies like octopus, raw clams, sea urchin, or salted fish roe can be sampled here too. The wine list is large and international.